also know as "Cathy Meng" and "Sabrina Meng,"
3551 et seq. ; T. 21, U.S.C., & 853(p); T.
USA INC. (“HUAWEI USA”), whose headquarters were in Plano, Texas. served as Deputy Chairwoman of the Board of Directors for HUAWEI. | subsidiaries throughout the world, including in the United States and in Eurozone countries. Institution | subsidiaries and other financial institutions located in Eurozone countries. more than $100 million worth of transactions related to SKYCOM through the United States. that it was terminating its banking relationship with HUAWET. subsidiaries throughout the world, including in the United States and in Eurozone countries. financial institutions located in Eurozone countries. financial institutions located in Eurozone countrics. institutions located in Eurozone countries. A subsidiary of Financial Institution 4 “U.S. management services, including for accounts in the United States. services, for HUAWEI’s Iran-based business while concealing the link to HUAWEI. Iran at least one U.S. citizen (“Employee 1”), whose identity is known to the Grand Jury. _ substance, that he was willing to provide information about HUAWEI. in substance and in part, that HUAWEI did not conduct any activity in violation of U.S.
export laws and that HUAWEI operated in compliance with all U.S. export laws. equipment to a third party, possibly in Egypt, which in turn sold the equipment to Iran. any transactions regarding HUAWEI’s Iran-based business. In reality, HUAWEI used US. control of SKYCOM were false and that, in fact, HUAWEI did comply with applicable U.S.
to be delivered to Financial Institution J on on about September 3, 2013. ‘business transactions with [Financial Institution 1].” These statements were all false. and services. Skycom is mainly an agent for Huawei. Huawei employees that was “signed by MENG Wanzhou,” the defendant. with HUAWEI and its subsidiaries and affiliates. HUAWEI, including the provision of U.S.-dollar and Euro clearing services to HUAWEI. communicated to various components of U.S. Subsidiary 4, including in New York City. with HUAWEI globally, including in the United States. Had the defendants told U.S.
and its subsidiaries and affiliates. and incorporated as if set forth fully in this paragraph. Title 18, United States Code, Section 1343.
others, did knowingly and intentionally execute a scheme and artifice to defraud U.S.
more materially false and fraudulent pretenses, representations and promises. outside of the United States through the United States. issuance by that agency of appropriate licenses relating to the provision of financial services. possibly in Egypt, which in turn sold the equipment to Iran. affiliates did not violate any applicable U.S. law.
. d. On or about July 24, 2013, SKYCOM caused U.S. Subsidiary 1 .
to process a U.S.-dollar clearing transaction of $52,791.08. Jury, to process a U.S.-dollar clearing transaction of $94,829.82. .
process a U.S.-dollar clearing transaction of $14,835.22. process a U.S.-dollar clearing transaction of $32,663.10. 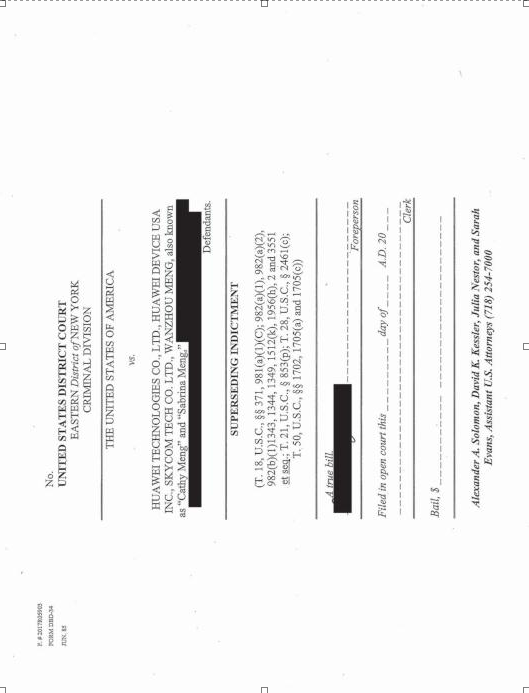 a U.S.-dollar clearing transaction of $118,842.45. extraordinary threats to the national security, foreign policy or economy of the United States. pursuant to the statute. 50 U.S.C. §§ 1705(a) and 1705(c). caused a violation of any of the prohibitions in the ITSR (31 C.F.R. § 560.203). 45. The ITSR prohibited providing financial services, including US. dollar-clearing services, to Iran or the Government of Iran. 31 C.F.R. §§ 560.204, 560.427. 45 are realleged and incorporated as if fully set forth in this paragraph. contrary to Title 31, Code of Federal Regulations, Sections 560.203, 560.204 and 560.206. Title 31, Code of Federal Regulations, Sections 560.203, 560.204 and 560.206.
realleged and incorporated as if fully set forth in this paragraph. District of New York, contrary to Title 18, United States Code, Section 1512(c)(2). from, proceeds obtained directly or indirectly as a result of such offenses. such offense, or any property traceable to such property. d. has been substantially diminished in value; or . Screen copy of Page 25 which is the last one.